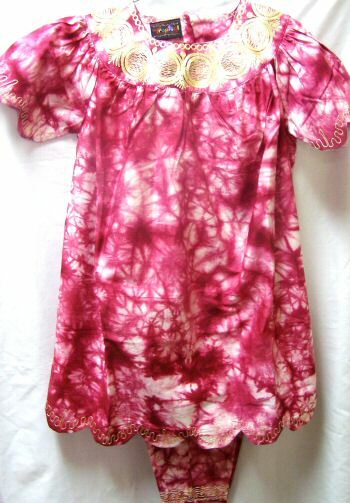 This dappled pink cotton tie and dye girls suit is a large with pants that have an elastic waist that is 17″ relaxed and 31″ extended. The pants have two deep side slit pockets and measure 31″ from waist to hem. The top measures 12″ across the banded embroidered neck. Below the neck band the shirt blooms from the light gathers beneath. It measures 27″ from neck band to scalloped embroidered hem. There are two buttons to close the 6″ neck slit in the back. The sleeves are scalloped to complete the feminine look.